Shapes are two-dimensional, meaning they have only height and width. FORMS are three-dimensional, meaning they have measurable height, width, and also depth. Sculpture is three-dimensional FORM. 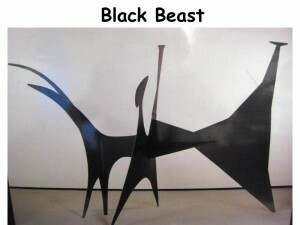 There are examples of three types of modern sculpture in this packet—WIRE SCULPTURE (Goldfish Bowl), MOBILE SCULPTURE (Object with Red Ball, Sumac II, The Circle, ) and STABILE SCULPTURE (Black Beast). Alexander Calder was key in creating and defining these three new types of modern sculpture. In Modern sculpture, the “rules” of classic sculpture—Sunken Relief, Low Relief, High Relief and Full Round— are often thrown out the window. Modern artists like Alexander Calder make up their own rules. Many modern painters and sculptures are still “challenging” the accepted conventions of art today. The FORMS used to create most of these sculptures are very thin and seem more like flat SHAPE and LINE than form. Notice how the DEPTH is actually created by suspending, or OVERLAPPING, the smaller pieces of the sculptures, which takes up SPACE. For instance, although the individual pieces and suspension wires of Untitled and Sumac II are very thin, to hang the artwork requires a larger DEPTH of SPACE in order for the mobile to move freely as it should. Mobile sculpture includes MOVEMENT in the most literal sense. The pieces of the mobile are constantly changing as air currents flow through these sculptures. There is also another way to create MOVEMENT in any artwork. MOVEMENT happens as the viewer’s eyes follow the evenly spaced RHYTHM of the colorful pieces of Sumac II. The artist invites our eyes to MOVE or follow these interesting shapes (forms) from side-to-side and top to bottom. The viewer is usually not even aware what their eyes are doing—moving around the artwork—but artists carefully plan for this to happen in a successful piece of art. Be sure ALL 8 prints are returned to the Packet Carrier after your Presentation is finished. 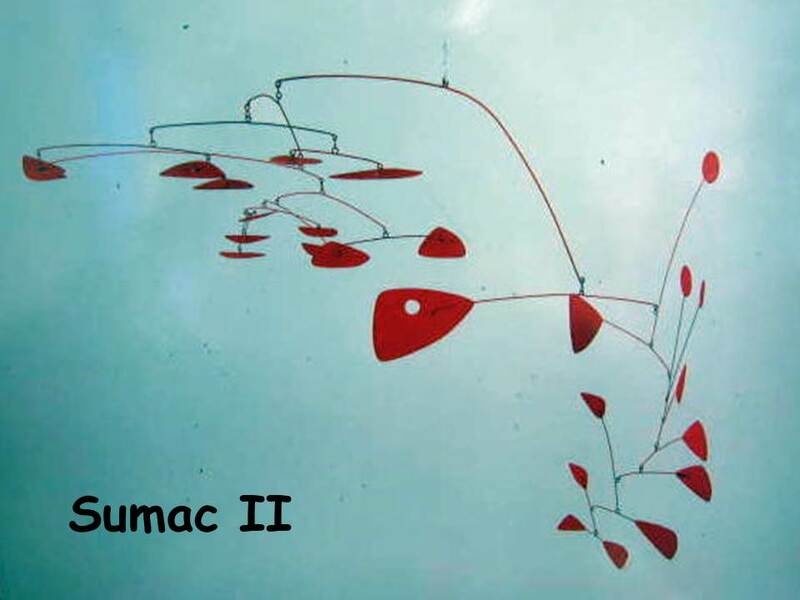 Calder was born into a family of artists. His grandfather, Alexander Milne Calder (from Aberdeen, in Scotland) and his father, Alexander Stirling Calder, had both been respected academic sculptors. In 1894, Calder’s grandfather made a sculpture of William Penn, the Quaker founder of Philadelphia, which still stands at the Philadelphia City Hall today. Calder’s father produced sculptures for many U.S. cities, including the statue of George Washington (1918) in New York’s Washington Square. Sandy’s mother was a professional portrait painter. This mobile structure is not suspended from the ceiling, as the most common type of mobile, but is instead attached to a stand. There is a pole behind the largest open circle, with another wire extending from the circle horizontally. 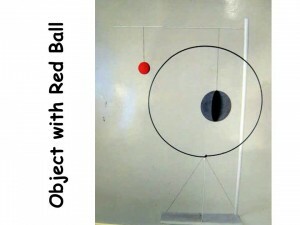 Suspended from the horizontal wire are two wires hanging vertically that suspend a red circle and a gray circle. The red circle was cut from sheet metal then painted. It appears very flat. The gray circle has more dimension. We see a somewhat flat circle of sheet metal facing one direction (left to right) and another circle of metal another (front to back), making this circle an abstract sphere (a ball). The other is only a circle. How many COLORS does the sculpture have? • To make an abstract SPHERE like the gray one shown here, cut out two circles (the same size) from colored paper or tag board. Cut a vertical slit from one outside edge to the center of each circle. Slide the two slit edges together. Try this with other GEOMETRIC SHAPES. For a triangle, cut one slit in a vertical direction, beginning at the center of the bottom edge, halfway up the triangle. Cut the slit for the second triangle in a vertical direction, beginning at the point of the triangle and cutting halfway down. Slide the two triangles together at the slits. FREEFORM SHAPES can also create this type of three-dimensional FORM. • Suspend a larger version of an abstract sphere from a string or yarn. Use the sphere as a center base for a larger mobile by attaching additional suspended pieces from the form. Create the sphere with corrugated cardboard and paint with tempera so it will keep its shape once pieces are added. The second edition of Webster’s New International Dictionary, from 1954, gave the following new definition: Mobile, a delicately balanced construction or sculpture of a type developed by Alexander Calder since 1930, usually with moveable parts, which can be set in motion by currents of air or mechanically propelled. When the first mobiles appeared in the early ‘30s, they caused a sensation. For the first time in the history of art, static sculpture was freed from being “glued” to the floor and set in motion. Albert Einstein once stood in the Museum of Modern Art, in New York, for 40 minutes, in front of one of the first mechanically propelled mobiles of Calder and said he wished he had thought of it himself. This mobile hangs from the ceiling, from a cord attached to the mobile at the top horizontal wire. Calder had to BALANCE the mobile so it would hang right. To balance a mobile you need to find the center of gravity. 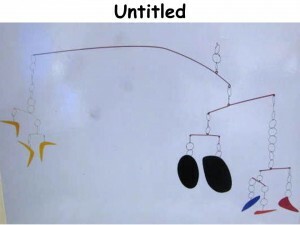 To create his mobiles, Calder invented a tool that he could use to locate the center of gravity. If you look at the top wire, with the cord attached to it, you will notice that the cord is not exactly in the center of the wire. If the weight on both sides of the mobile were the same, the cord would attach in the center of the crossbar and the mobile would BALANCE evenly. In this case, the cord is off center, so we know the two sides do not weigh the same. Which side of the mobile is heavier? The left side because the cord is moved over closer to the left side to make up for the extra weight or, in other words, the center of gravity is somewhere near the heavier side. Point out the way the circle repeats in the NEGATIVE SPACE of the largest section of the mobile. • Finding the center of gravity and balancing a mobile will be hard for younger kids. A simple way for them to make a mobile would be to attach shapes cut from colored paper to a wire coat hanger, with yarn. Fishing line or thread will work to hang pieces but yarn is bulkier and much easier for smaller hands. The hook on the top of the coat hanger makes the mobile easy to hang when finished. • For older kids, straws work well for the crossbar pieces of a mobile. Yarn or string can be taped to the straws. Dental floss or fishing line could be attached with a needle. Popsicle sticks, chopsticks, wooden skewers, toothpicks, cut pieces of wire coat hanger, florist wire, plastic silverware, or twigs are other easy and inexpensive materials for mobile crossbars. 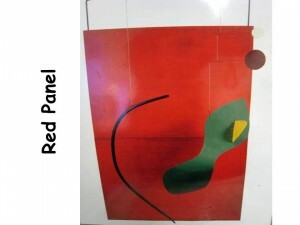 • Abstract GEOMETRIC SHAPES or FREEFORM SHAPES are more “Calder like” when making mobiles. However, ORGANIC SHAPES (butterflies) also work nicely (especially K-2). Butterfly SHAPES can aid in teaching or reviewing an additional lesson on SYMMETRY as project is created. If you wish to emphasize SHAPE with this packet, make a point to specify the type of shape you want them to cut (geometric, organic, or freeform). Good materials for creating mobile SHAPE include tag board, poster board, painted corrugated cardboard, recycled cereal boxes, recycled milk jugs and plastic containers, colored foam craft sheets, recycled orange juice can lids (the edges are not sharp and they can be painted with acrylic paint). Alexander Calder was one of the most important innovators (creator of new ideas) in 20th-century sculpture. Although he was born into a family of artists, he graduated from the Stevens Institute of Technology, in New Jersey, with a degree in mechanical engineering. His engineering expertise served him well in the type of sculpture he invented. In 1923, “Sandy” (the name his friends used) turned to painting and took up studies at the Art Students League in New York City. He quickly figured out it was not painting, but sculpture, that he had a passion for. Calder, considered one of the most inventive artists of modern time, challenged the principles of modern sculpture and his innovative works are in countless museums around the world. In September 1943, (during WWII) Calder had an exhibit of over 80 of his works displayed in New York’s Museum of Modern Art. The exhibit showed his progression of work from his earliest to his most recent. He was the youngest artist ever honored in this way. After the exhibition, Calder became the best-known contemporary sculptors on both sides of the Atlantic. As America became drawn more and more deeply into the Second World War, Calder’s vibrant art seemed to serve as a way of relaxing and cheering people. His humor and optimism were an effective remedy against depression and despair. Calder amused his audience with his effervescent spirit and great inventiveness. Does it make you think? Most will say it makes them think to figure out what the sculpture is supposed to “be”. Calder created the abstract sculpture to make the audience “think”. The sculpture is NONREPRESENTATIONAL, which means that it does not represent anything real or alive. The “art” of the work is in the appreciation of its COLORS, MOVEMENT, and SHAPE. (Grade 5) Make and attach a wire hanger across the top edge of a painted corrugated cardboard rectangle. Use fishing line to suspend cut shapes—suggest a piece or two of a colorful drinking straw or tubing (even a colored rubber band), and at least one colorful GEOMETRIC SHAPE or FORM—in front of the rectangle from the hanging wire to create a BALANCED arrangement. 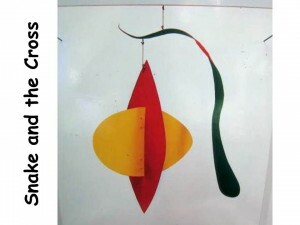 Calder used quite unlikely everyday objects for some of his mobiles. He often used things like coffee tins, sardine cans, matchboxes, and pieces of colored glass. His preferred materials were wood and later metal, strikingly painted in the primary colors red, yellow and blue or in black and white. Show kids how tall this piece of sculpture stands (36”). Explain that the sculptures the kids will create will be much smaller than Calder’s. Have any of you ever seen a mobile suspended over a baby’s crib? It is believed that mobiles are good for helping very young babies learn to focus their eyes. It is also good exercise for their eyes to follow the MOVEMENT of a mobile. How many of you think it is relaxing to watch a mobile? Calder also produced paintings—he started out on his artistic career as a painter—as well as drawings, witty toys, jewelry, tapestries and household objects. He also became renowned for his book illustrations, graphic works and painted airplanes and cars. In 1973, Braniff International Airlines commissioned Calder to paint one of its DC 8 jetliners. In 1975, Calder painted a car—a BMW. He painted both of them like a bright colored canvas. This type of mobile is attached to the wall. An outside wooden frame, painted white, surrounds the mobile. The top corners of the frame are attached to the wall from behind, with wire (point out the wire). The rest of the mobile is suspended from string in the center of the frame. Does this mobile look like its title “Snake and the Cross”? Can you think of a different or more appropriate title for this mobile? In October 1976, the Whitney Museum in New York opened a major retrospective of Alexander Calder’ art. It represented every phase and aspect of his work, from the beginning of his career to the year 1976. The title of the show was Calder’s Universe. A short time later, on November 11, 1976, Calder died unexpectedly from a heart attack. The Whitney exhibition then became a living memorial to the artist. Calder loved to laugh and tell jokes. He was never solitary, but radiant and exuberant, exuding great warmth. His imagination was dazzling and his creations full of fun, humor and poetry. He was called the “Mozart of space” and gave pleasure to people. He had a joy for life. 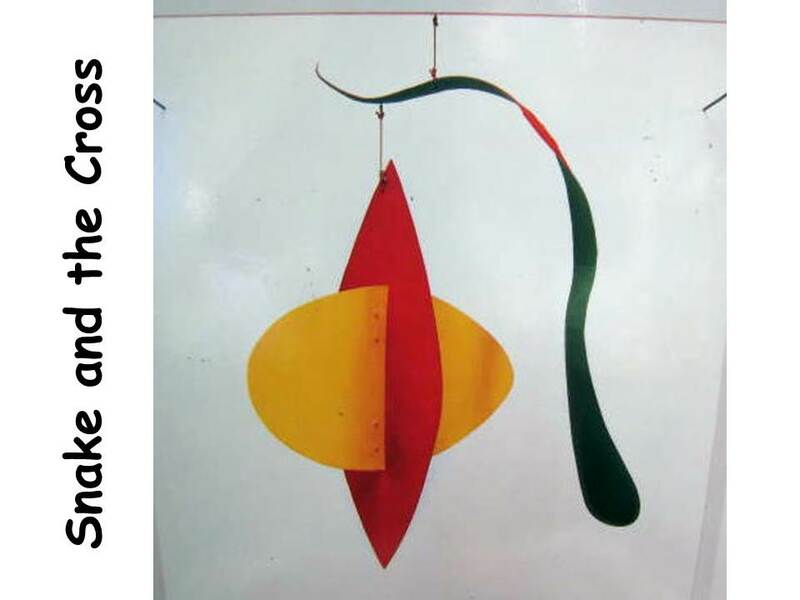 Calder called this work “UNTITLED”. Can you think of an appropriate title for this work of art? Do any of Alexander Calder’s works remind you of the universe—planets, stars, comets, moons, or meteors? Could some of the SHAPES in this mobile be shapes found in space? • Use florist wire to make chains to connect the shapes with their strings or fishing line on the mobile. • Create a planetary mobile, using FORMS of the universe. Include aliens, space ships, comets, asteroids, even flying saucers if you like. Alexander Calder created many different sculptures using only wire. He would bend the wire to create a picture much as a pencil draws a picture on a piece of paper. Besides Goldfish Bowl, his wire sculptures include portraits of people—friends, movie stars, comedians, circus performers. He even made wire sculptures of animals—horses, bulls and one very large freestanding cow. Calder made an original contribution to portraiture with his wire figures. He did portraits of many of his friends in this medium and always had a pair of pliers in his back pocket, ready to do another wire portrait if he saw something to inspire him. 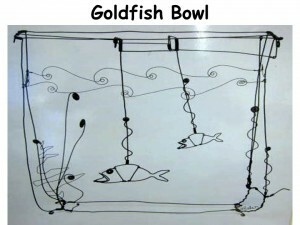 This is a three dimensional wire sculpture of a goldfish bowl. It is also a work of art. When an artist finishes painting a masterpiece, he signs his name in the corner of the painting. Calder has done this in his wire sculpture. Can you see his name shaped from wire, in the bottom right hand corner? Can you find the bubbles in this picture? How can you tell these are bubbles? On the wire that suspends the fish, there is another wire squiggling up a little and ending in a tight spiral circle. There are also two more of these on the right side of the bowl. The tight spiral circles on the left have a straighter stem base so these may be plants. The squiggles under the spiral circles seem to show the MOVEMENT of the bubbles flowing upwards, towards the surface of the water. The tight spirals seem like round circles you might draw to represent bubbles in a picture. Can you see HORIZONTAL LINE in this sculpture? Vertical Line? Diagonal Line? Curved Line? Zig zag Line? 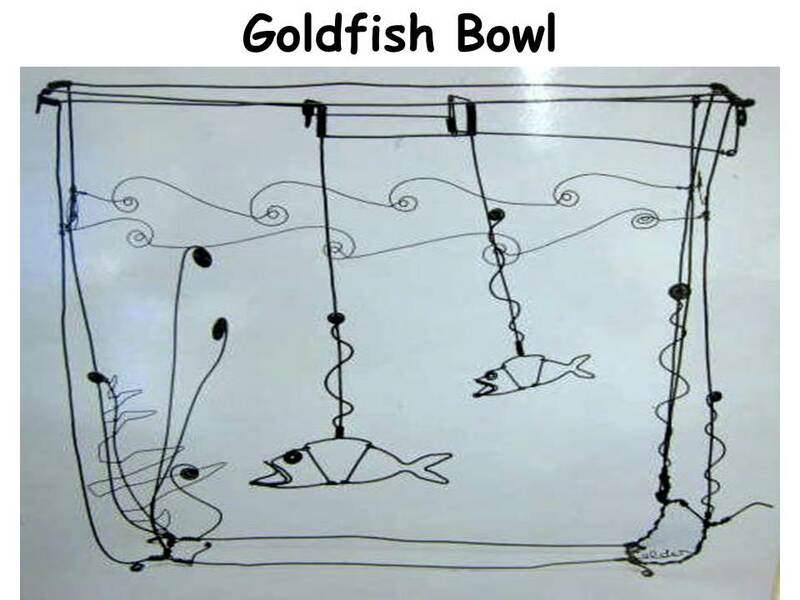 • Draw a simple line drawing of a goldfish bowl with fish. Paint over the lines with black paint. Do not add any color to your picture so that it resembles this simple sculpture which was created with sculptured wire LINE. Draw on light blue construction paper to add interest. Use all five LINE TYPES in your drawing—HORIZONTAL, VERTICAL, DIAGONAL, CURVED and ZIG ZAG. Your finished art will be a painted LINE project masterpiece! • Create a wire sculpture using florist wire that comes on a “paddle”. This bulk wire is thin, much less expensive (about $2.00 a paddle), available in most craft stores in different gauges (thicknesses) and additionally comes in green, silver and sometimes gold. This wire can be sculpted without using any tools. Florist wire can be cut with sharp scissors if you do not have pliers. You could cut the wire in about 24” sections to start with. For most, this will be enough to make a complete sculpture. You could also cut a piece of thinner gauge wire, to help add variety. Create pictures with the wire. Suggestions for wire sculpture projects include someone fishing, a weightlifter, a Star Wars character, cartoon character, trapeze artist from the circus, a rainbow, clouds, sun, a clown, your mom and dad, you! • Use colored yarn and white glue to “draw” a LINE picture of a goldfish bowl on blue construction paper. First, use the glue to draw the outline of your goldfish bowl on blue colored paper or poster board. Cover this glue with a line of either white or blue yarn. Then draw your fish outline with glue and colored yarn. Green yarn will decorate the bowl with a few underwater plants. Shell macaroni can be glued and painted to create an interesting textured “gravel” on the bottom of your goldfish bowl. Calder not only built mobiles, he also built stabiles, fixed static steel constructions made of steel plates screwed, or bolted, or riveted together. Calder’s stabiles can be found in numerous public places throughout the world, usually in parks. They are usually painted black or red. The sculptor Hans Arp invented the name “stabile” for this type of Calder sculpture, in 1932. This type of sculpture is freestanding and it does not move. “Black Beast” sounds like something scary. Do you think this title is appropriate? Does this sculpture resemble a “Black Beast”? Does it resemble anything else? Read the Calder quote sculpture quote, written at the top of the page, to the class. Is this type of sculpture (a stabile) a “joy” to look at? Is it fun or enjoyable? Does it make you smile? Does it puzzle or confuse you? 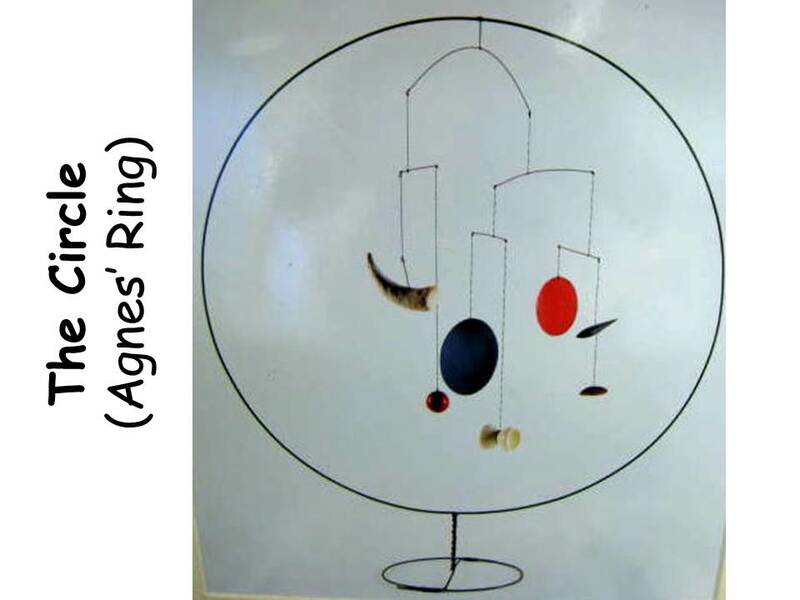 Just remember, Calder never intended the viewer to “figure out” what the sculpture represented. There are no hidden “meanings” here. His sculpture was meant to be enjoyed simply for what it is—Three-dimensional COLOR, FORM and sometimes LINE—and nothing else. Create a stabile sculptor using poster board, corrugated cardboard, tag board, recycled cereal boxes, shirt boxes, etc. 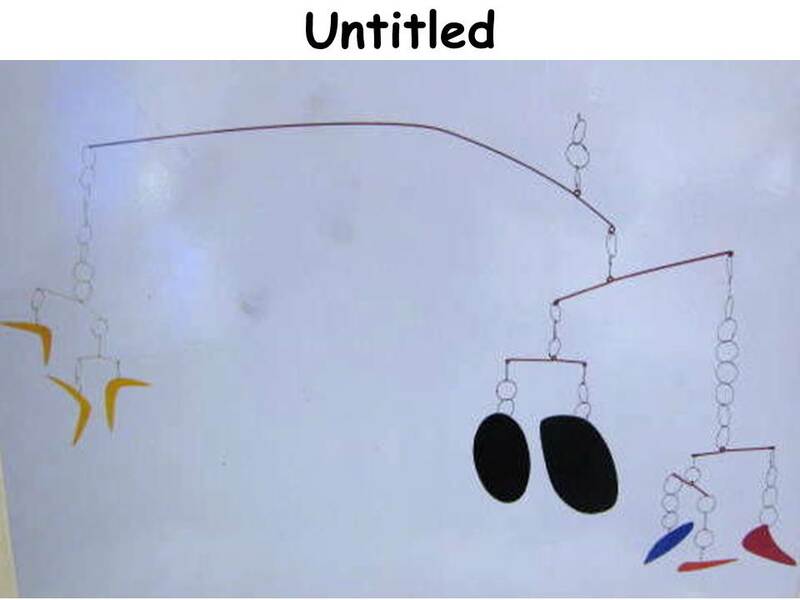 Paint the pieces (Calder used mostly red, yellow or black for his stabiles) before you glue them together permanently. 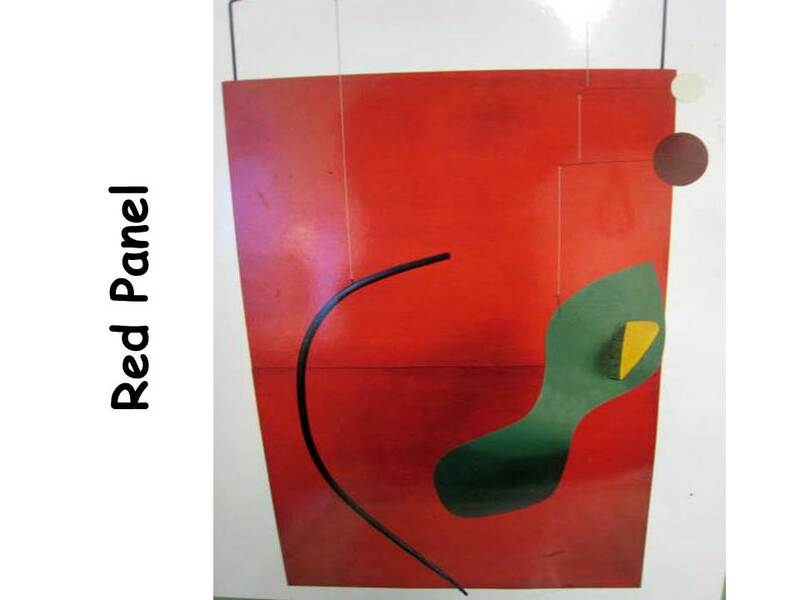 A good way to connect the pieces would be the same way as the SPHERE project idea from Object with Red Ball, by cutting short slits and sliding the pieces together at these slits. Another way to join the pieces would be to cut tabs for gluing them together. Masking tape should work well because you can easily paint over this type of tape with tempera paint and it won’t be obvious.